I observed this juvenile Red-tailed Hawk while video a large communal roost made up of mostly European Starlings and Great-tailed Grackles. The hawk had somehow inserted himself right in the middle of a group of starlings. The Red-tailed Hawk put on quite an effort to portray himself as uninterested in the small black birds. The hawk preened and nonchalantly ignored the mass of starlings gathering around him. The European Starlings were preoccupied with their roosting activities and hardly gave the hawk a passing glance. Some starlings were perched nearby, and occasionally moved even closer to the hawk. At other times, larges flocks of starlings would fly in and join those already perched near the bird of prey. From their reckless behavior you might even believe that the starlings didn’t realize the hawk was there. Eventually, the temptation became too great for the hawk. 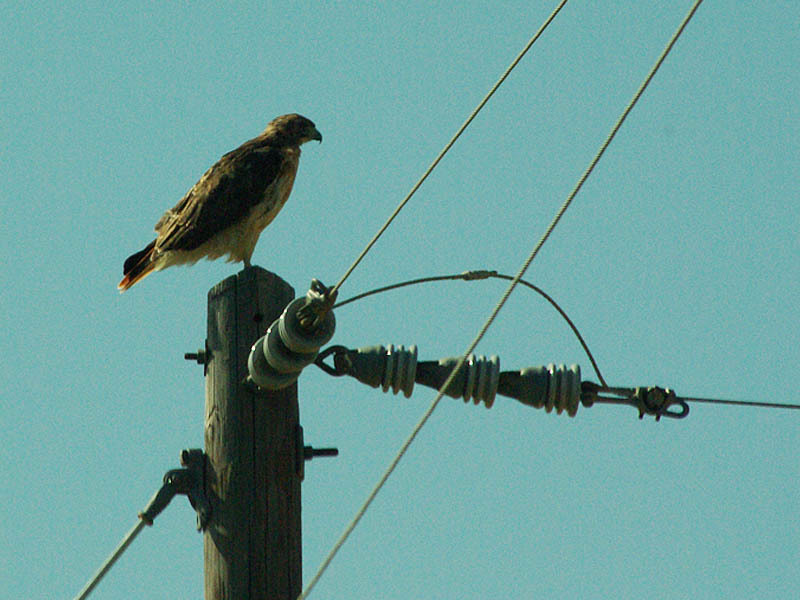 The Red-tail launched himself from his telephone pole perch, swooped low to the ground, and then flung himself up into a group of roosting birds. Starlings scattered everywhere, but the hawk came away from the encounter empty-handed. The hawk quickly regained his composure and then struck again just a little further down the road. This time a massive cloud of starlings rose into the air, and I lost sight of the hawk. Its not clear whether the young hawk had better luck on this second attempt than he did on his first.